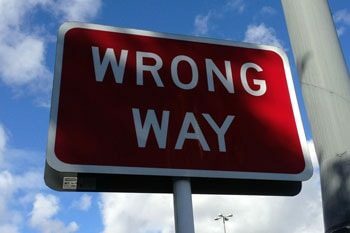 Don’t Let These Common Errors Stop You From Getting Your Best Workout! 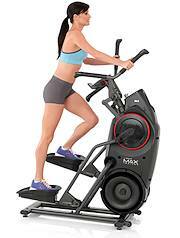 An elliptical is a great way to get a total body in your own home. But just like any other exercise equipment, you have to make sure you’re using it properly to reap the benefits. We’ve put together a list of common mistakes that people make on an elliptical that will not only lower the effectiveness of your workout, but can also lead to injury. Avoiding these common blunders will ensure that you get the most out of every minute of your elliptical session. When you hop on the elliptical and have the resistance very low, you’ll feel like you’re zooming along! Surely covering all of that distance means that you’re killing your workout, right? When you have little or no resistance on an elliptical, you’re not actually working any of your muscles or getting your heart pumping, which means no results. With that being said, you don’t want to have too much resistance either. If you’re having to push with all of your body weight just to get moving, or you find your body twisting or bending forward from strain, you’ve got the resistance set too high. You want your legs to be pushing through each stride, to keep you moving in a smooth, continuous motion. Once you find that sweet spot, stick with it for the duration of your session. You’ll feel it working. Not too much, not too little, just the right amount of resistance to see results. Don’t let yourself slouch when you’re on the elliptical! This will create strain on your back that can lead to injury. Plus, poor posture means that you aren’t engaging your core muscles and you’re losing out on all that strengthening and toning. Standing up straight will ensure that you are working all of your core muscles, which gets you that full body workout you’re looking for. Different types of machines will feel more comfortable and work better for different people. For instance, front drive models will create the feeling of leaning forward. When shopping for an elliptical for your home, be sure to try out the different types and find the one that works best for you. 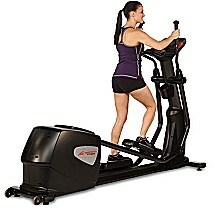 The Bowflex MAX Trainer – Read our full review here. Do a 5 min warm up to start. Finish with a 5 minute cool down. Another fun way to switch up your workout is to do it in reverse! When you’re going forward you’re really working your quads, but going backwards will give you an awesome workout for your hamstrings and glutes. As your muscles get stronger and you have better overall health, your regular workout is going to feel a lot easier. You need to make sure that you continue to push yourself. You won’t be making any progress if you’re still doing workouts that are super easy and don’t even have you breaking a sweat. Increase your resistance, speed and/or time for a new challenge, or try out some more difficult HIIT programs. Any of these options will have you building your muscles and your cardio capability. Use your progress as fuel to keep making strides in your fitness. NordicTrack ACT Commercial – See our full review here. The handlebars are there for a reason, so use them to your advantage. This will have you engaging not only your arm muscles, but your core muscles too. Just like with your legs, be aware your resistance levels. Your arms shouldn’t be flinging back and forth, but you also shouldn’t feel like you’re moving mountains. Find a level that has your arms firing and your core stabilizing, while you maintain fluid motion. When you’re looking for your home elliptical, keep in mind that some brands, like Horizon and Sole Fitness are ergonomically designed and feature adjustable foot pedals to keep you from experiencing loss of feeling. Make sure that you are entering your height and weight into your machine before you work out. This information allows you to get an accurate idea of the calories that you’re burning. Don’t stop at your stats though! Use your elliptical’s virtual programming to get the most out of each session. You can try HIIT programs or virtual coaching to keep you moving and motivated! Branch out from the elliptical and do some other types of exercise. For instance, try doing some body-weight exercises to strengthen your muscles before or after your elliptical session. The best thing about these exercises is that you don’t need any equipment and can even do them in your own living room. Next time you’re ready to get on your elliptical and sweat it out, make sure you’re doing it right. Remember the things we’ve talked about and you’ll be crushing your goals and seeing your progress in no time. 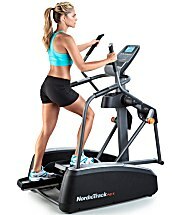 And, if you’re ready to find the perfect elliptical to get started at home, check out some of our Best Buy Elliptical choices.